In recent years, Hartlepool has undergone a makeover, with a lot of money spent on regeneration. Denise Sparrowhawk, who was in charge of the event, told me that the new(ish) library was a massive improvement on its predecessor, which occupied a traffic island and was therefore not especially well visited. The move to an airy and convenient building prompted a big upsurge in customers – proof, surely, that there is a real demand for good libraries, even in the age of cheap book-buying. It’s simply a matter of providing an attractive venue, with an enthusiastic staff and a really extensive stock of books, as well as other things such as computers (the latter are important these days, but books are the key element!) Well, perhaps it isn’t entirely simple. But it’s something worthwhile to aim for, and the dividends from proper investment can be enormous. I was startled to learn that two members of the cast for the mystery event had not met the other two members before that very evening. One couple were students at the local sixth form college, who had become interested in murder mysteries after attending a previous mystery event at the library. As it turned out, young Adam and Rachel were terrific actors and I’m sure that their parents, who were in the audience, were very proud of their performances. One other thing about Hartlepool. The audience did very well with their solutions to the mystery. It’s obviously a great place for detectives. Yet has a crime novel ever been set there? If so, I’ve never come across it. One of the highlights of the second day of the North East tour was a visit to Alnwick and Barter Books, one of the largest second hand bookshops in the country. Like another of the best bookshops, the Hay Cinema Bookshop, Barter Books is housed in a building converted from a very different previous use. It was once a railway station. Now the trains that run are model engines, traversing lines inside the shop and above head height. Showing what I claim was incredible restraint (maybe threats of dire consequences from my family if I added to the mass of books in our house had a bit to do with it as well) I didn’t actually buy a book there. I did, however, see a sign offering for sale a Golden Age mystery I’ve long sought after. It is Careless Corpse, by the maddening but enjoyable C. Daly King. Alas, its price was prohibitive. I’ll have to keep searching. After that, it was on to a very different, and much more contemporary, collection of books – the one held by South Shields library, venue for another Victorian mystery. Pauline Martin, who was in charge of the event, proved a very friendly companion – even though she’d worked a twelve hour day and must have been exhausted by the end of it - and I was surprised and delighted when she presented me with a framed watercolour. Pauline’s efficiency was yet another reminder, not that I needed one, of how good the best librarians can be. I’ve met a great many generous and charming library staff in my travels over the last few years. The libraries are a wonderful public service and I wish that the government would invest more heavily in them, since I’m convinced that they play a vital part in fostering the identity of communities, in prosperous and deprived areas alike, as well as helping to foster the love of books. People with disabilities, for instance, often benefit hugely from having a good local library and I was glad to have the chance to chat to quite a number of those who were present at the South Shields event. I’ve just returned along rain- and wind-swept motorways from a tour of the North East of England, combining a holiday with four performances of my Victorian murder mystery event, ‘Who Killed George Hargrave?’ I’ve never done anything quite like this before, and before setting off, I was rather daunted by the prospect of conducting four events on consecutive days. As things turned out, all went well. First stop, on Wednesday evening, was Gateshead Library. The only time I’d visited Gateshead before was to watch a football match – nearly forty years ago – which proved, if memory serves, to be a rather tedious game. This was a very different experience. The library boasts an excellent theatre and Dot Cameron and her colleagues among the library staff had done a great job of achieving a sell-out audience of 120 – about the largest audience that is practicable for an interactive event like this, as I spend the interval discussing the mystery with members of the audience, giving clues and offering the occasional red herring. Excellent performances and smooth organisation made for a thoroughly enjoyable evening. Plentiful book sales also helped, but that isn't the main point of the event (honest!) The chance to talk to a sizeable group of mystery fans is always appealing, and I've found that the mystery event attracts much bigger crowds than a conventional talk. A talk - about locked room mysteries - forms part of the event, whilst the audience's solutions are being judged, but there's no doubt in my mind that people prefer, given the choice, to have some involvement in an event, rather than simply be 'talked at'. Easter Sunday saw the television version of Alexander McCall Smith’s astonishingly successful The No. 1 Ladies’ Detective Agency. This screening achieved an added, if rather shocking, poignancy as a result of the death a few days earlier of the director, Anthony Minghella. I first came across Minghella’s work when he wrote some early, and excellent, screenplays for ‘Inspector Morse’. Later, I was impressed by his film of Patricia Highsmith’s brilliant, but tricky to adapt, The Talented Mr Ripley. I haven’t seen The English Patient, widely thought to be his masterpiece (and I also managed to avoid the Labour Party General Election broadcast that he turned out in 2005), but all of his work that I have seen was intelligent and appealing. His death at 54 is a tragic loss. The following day, I watched another episode of ‘The Fixer’. The contrast between this thriller and the gentle, Botswana-based work of McCall Smith could hardly be greater. ‘The Fixer’ is tough and trendy, but I like its pace and its humour, as well as the performances of the four main characters. With television, as with books, let alone food, it’s good to vary the diet from time to time. I’ll certainly be watching ‘The Fixer’ again. Now, this is blog post number 167. I’ve kept at it for 167 consecutive days, but I’m heading up to the North East shortly for the first of four Victorian Murder Mystery events (details on the website.) Please don’t go too far, you’ll have a respite for a mere couple of days – I’ll be back blogging on Saturday! Meanwhile, if you haven’t done so recently, you may like to take a look at my website. There’s a new article about Anthony Berkeley, that master of Golden Age mysteries. Plus my recent interview with Minette Walters. And if all that isn’t too much, an interview of me by journalist David Morgan. I’ve just acquired a signed copy of a memoir of Ellery Queen by Eleanor Sullivan. Eleanor was for many years the editor of Ellery Queen’s Mystery Magazine, and not too long before her untimely demise, she purchased my first short crime story, 'Are you sitting comfortably?' – on the generous recommendation of Robert Barnard, who’d been a guest speaker at the writing seminar where the story won the prize. That acceptance was one of the highlights of my early writing career. A few years ago, Crippen and Landru published The Tragedy of Errors by Ellery Queen. The title story is, in fact, the very detailed outline for a novel that was never actually written. I was startled when I read it – because the central plot device was similar to that in my novel Take My Breath Away. And ironically, I’d consciously modelled the plot on an idea from another novel – not by Queen, though, but by the Queen of Crime, Agatha Christie… Her book, Curtain, is in my opinion one of her most fascinating, and yet it has had relatively little attention, perhaps because it appeared at such a late date (though it was written when she was at the height of her powers.) I felt, though, that the idea was capable of being developed in a very different way, and that's what I tried to do with Take My Breath Away. A welcome arrival on the doormat was Simon Brett’s ninth Fethering Mystery, Blood at the Bookies. Brett is an expert practitioner of the light traditional mystery, often with a liberal helping of humour. He began with the Charles Paris books, featuring an actor with a taste for whisky and amateur detection. These are great fun, with plenty of well-targeted jokes. Later, he created Mrs Pargeter, widow of a career criminal, and now the Fethering books have earned a loyal following. But he’s done much more even than that. A Shock to the System was a stand-alone novel that was filmed. Dead Romantic was, I thought, even better, possibly the best Brett that I have read. It’s not a very well known book, but it’s very clever and I do recommend it. And then there are his short stories. I was delighted to include one in a CWA anthology some years back, and he has produced two first rate collections, A Box of Tricks, and Crime Writers and Other Animals. Sometimes I think Brett’s crime-writing talents may actually be seen to best effect in the short form, which perfectly suits the ingenuity of his ideas and his sharp, snappy dialogue and ability to sketch character with economy and precision. Among his other achievements are work for radio and television, most notably the popular series ‘After Henry’. I can testify that he is a very witty public speaker, and he also manages to find time to act as President of the Detection Club. In short, Simon Brett is a consummate entertainer. On Maundy Thursday, I had the pleasure of meeting someone with whom I’ve been in contact for a few years, but never actually encountered in person until now. Tim Heald lives in Cornwall, and I live in Cheshire, so it wasn’t easy to arrange a get-together, but the combination of a series of speaking events (to a number of cricket societies) and an interest in visiting Liverpool during Capital of Culture Year lured him up to the North West and we had a very enjoyable conversation over lunch at the Liverpool Athenaeum. His series of books about Simon Bognor are sadly difficult to track down now, so I was very glad when Tim presented me with a couple of inscribed copies and I shall hunt for the other titles in months to come. Tim had the pleasure of seeing Bognor reach the small screen, but the television series was not quite as successful as he might have hoped. Apparently, Derek Fowlds, who was so popular in ‘Yes, Minister’ and ‘Heartbeat’ was a strong candidate for the part of Bognor, and I can’t resist thinking that this casting would have helped the televised version to achieve greater viewing figures. Nevertheless, it’s a real achievement to see your work on the box – something that for many of us remains only a dream. Tim’s current series features Dr Tudor Cornwall, reader in criminal studies at the University of Wessex and I recently read A Death on the Ocean Wave, in which Tudor is guest speaker on a transatlantic crossing. And I’d also like to mention an anthology he edited way back in 1990, to celebrate the Agatha Christie Centenary. A Classic English Crime is full of good stories and is one of the most entertaining compilations of traditional detective fiction of the past twenty years. When I started this blog last October, I really didn’t know what to expect. Nor was I sure how long I’d want to keep it going. Suffice to say that it’s been a terrific experience, which, if I’d had any particular expectations, would certainly have exceeded them by far. Blogging has put me in touch with a wide range of people both in the UK and much further afield, whose comments and support I much appreciate. I’ve been directed to good books and films, for instance, that I might never otherwise have bothered with. And some of the most exciting developments have come entirely out of the blue. There’s definitely something addictive about the blogosphere. I’ve found it both fascinating and terrific fun. Of course, I’m conscious that, potentially, it’s a distraction from the actual business of novel writing. But I’m sure it’s possible to strike a sensible balance between the two, even if I haven’t quite managed it yet myself. I’d like to comment more on other people’s blogs than I do, and I really need to do a bit more on my current novel than I’ve achieved so far. So what does the future hold for this blog? Well, I plan to keep it going indefinitely, and I think the mix will continue much as before. Maybe a little bit more about true crime cases, but still plenty about other crime writers, films, an occasional mention of music and so on. Thanks again to everyone who has encouraged me - I'm very grateful. And have a very good Easter. ‘If you’re a midlist writer…you’re more likely to creep into the store, approach the shelves with dread, and anticipate the worst. There are loads of tips to the aspiring writer – most frequently, ‘Don’t do it.’ But he knows that his readers will almost certainly ignore his advice. Because that’s writing for you – it’s an addiction. David Armstrong is a good writer, but here he is at his best. It’s a very funny book, and for writers like me and many others, there is a stab of recognition of a shared experience in almost every chapter. I’ve had a look round the brand new Hard Day’s Night Hotel in North John Street, Liverpool, a short walk from my office. It’s one of the many new places that has opened up during European Capital of Culture Year, and it’s also an outside possibility as a venue for the launch of Waterloo Sunset. To be honest, I’m not actually sure that there is going to be a launch, but this would certainly be an impressive setting for one. The Beatles theme is, of course, inescapable. There are statues of the Fab Four outside the building, high above the street. Inside, there are endless bits and pieces of memorabilia. Photos, artwork, album covers, yellow submarines, the framed score of ‘Yesterday’ signed by Paul McCartney and Sir George Martin. I did not, however, see any indication of a Heather Mills Suite…. All the Lonely People, my first novel, took its title from a wonderful Beatles song, ‘Eleanor Rigby’. Yesterday’s Papers, my fourth, had a plot with its roots in the era of Merseybeat in the sixties. But my interest in the Beatles dates back even further. When I was about eight years old, I saw the four lads in purple suits opening a carnival in Verdin Park, in my home town of Northwich. They had just hit the top of the charts and presumably were just fulfilling a contractual obligation. I remember vividly a huge crowd of screaming teenage girls, having hysterics at the sight of Paul in particular. He’s never been short of admirers ever since. Why did Margot Bennett never publish a crime novel after winning the CWA’s ultimate accolade in 1959? It’s baffling, not least because her success with Someone from the Past wasn’t a one-off. She’d built a career of genuine achievement. Bennett was born in 1912 in Scotland; she worked as an advertising copywriter in Europe and Australia, and as a nurse during the Spanish Civil War. Her first novel, Time to Change Hats (1945) was much acclaimed, and was followed by another enjoyable detective story, Away Went the Little Fish. After that, she really got into her stride with the ingenious The Widow of Bath, which was admired by Julian Symons, a great advocate of Bennett’s excellence. Farewell Crown and Good-Bye King concerns the hunt for a missing financier; it is a slight disappointment, because the key plot twist is not too difficult to figure out. The Man Who Didn’t Fly poses a terrific puzzle: four men were supposed to travel on a flight, but when the plane crashed, only three had boarded it. Who was the fourth man – who has also vanished – and why didn’t he take the flight? At the age of 47, and with the CWA Award under her belt, why would Bennett give up on crime? It may have had something to do with money: she did write for television in the 60s, contributing episodes to ‘Maigret’ and ‘Emergency Ward Ten’. She may have lost interest in the genre – she wrote two non-criminous novels, again in the sixties, but they made little impact. And she also published The Intelligent Woman’s Guide to Atomic Radiation in 1964 (did she think that unintelligent women wouldn’t be interested?) But none of this explains adequately why she abandoned crime when she reached the heights. She was once quoted as saying: ‘All through my books, the best I have done is to make the people real.’ It’s no mean feat. And yet she isn’t alone in going out at the top – Dorothy L. Sayers and Anthony Berkeley are two even more illustrious writers who gave up on crime novels long before they died and when, one would have thought, they still had plenty to offer. Having recovered from the disappointment of Topaz, I’ve watched another Hitchcock film from the 1960s, Torn Curtain. This Cold War movie, the sombre tone of which contrasts sharply with the witty and gimmick-heavy James Bond movies of the era, has the benefit of two highly bankable stars in Paul Newman and Julie Andrews. The script was written by the estimable Brian Moore (although apparently Keith Waterhouse and Willis Hall, of all people, were involved in re-writing it.) Bernard Hermann was commissioned to write the score, but Hitchcock sacked him and hired John Addison in his place; Hermann’s work is now available on CD, but I haven’t heard it. Torn Curtain is certainly better than Topaz, but this only lifts it to the level of the so-so. Newman is a likeable actor (Butch Cassidy is one of my favourite movies) and Julie Andrews is lovely, but there isn’t much chemistry between them. And, for the most part, the film lacks the pace that nowadays we would take for granted in a major thriller. Cutting it by thirty minutes would have worked wonders. There are good moments, however. The murder of Newman’s ‘minder’ in a lonely farmhouse is an extraordinary scene, underlining just how difficult it really is to kill someone. The escape of Newman and Andrews from a crowded theatre packed with East German police is well done, as is the key scene on board the ship that is supposed to be taking them to freedom. So – worth watching, but not quite worthy of all the talented people involved in its making. Twenty years ago last autumn, I attended the inaugural meeting of the Northern Chapter of the Crime Writers Association at Boroughbridge in North Yorkshire. It was a small gathering in those days, but it was my introduction to the likes of Peter Walker (aka Nicholas Rhea, creator of that massively successful series ‘Heartbeat’), Reginald Hill and Robert Barnard. And in the intervening years, they have become friends, as have a good many other fellow northern writers – including my fellow members of Murder Squad: Margaret Murphy, Chaz Brenchley, Ann Cleeves, John Baker, Cath Staincliffe and Stuart Pawson. Thanks to the organisational genius of Peter Walker (top picture), and the calm efficiency of his wife Rhoda, the Northern Chapter has flourished over the years and the twentieth anniversary prompted a splendid celebration at the original venue, the Crown Hotel. After a period of illness, Peter stood down as convenor, to be replaced by Roger Forsdyke (like Peter, a very experienced police officer.) And yesterday I went back to Boroughbridge again, to the first event of the next twenty years of the Northern Chapter’s life. Stuart (lower picture) was there as well and I managed to get him to sign my copy of Grief Encounter. I’ve mentioned this book with its wonderful title before; it’s the latest Charlie Priest, and the good news for Stuart’s fans is that he’s currently working on a new entry in his long-running series. Thanks to a note in the latest issue of CADS, I became aware of a privately published American fan magazine called ‘Give me that Old-Time Detection’ and the publisher, Arthur Vidro, has kindly supplied me with a couple of back numbers. This is a magazine slimmer than CADS, but on roughly similar lines. Some of the contributors are familiar to CADS readers – authorities on Golden Age writing such as Tony Medawar, Marv Lachman and Charles Shibuk. One of the issues (#10) focuses on that witty and innovative writer Anthony Berkeley, founder of the Detection Club and, under the name of Francis Iles, an early practitioner of psychological suspense. One gem is the re-publication of a 1926 short story, under Berkeley’s real name, called ‘Over the Telephone’. As the editor says, it foreshadows the first Iles novel, Malice Aforethought, which is an absolute classic of the genre. I wrote an article for ‘Mystery Scene’ recently about Berkeley, and Philip Scowcroft coincidentally wrote about him for CADS. But he’s such an interesting writer that I’ll talk more about him in a future post on this blog. Meanwhile, fans of the Golden Age may like to check out Arthur Vidro’s magazine. It’s a labour of love. I’ve not paid much attention to television thrillers, as opposed to detective dramas, in recent years. But a trailer attracted me to last week’s opener in a new series from ITV called ‘The Fixer.’ I was tempted and I fell. Of course, I should have been writing the new novel. But actually, ‘The Fixer’ was too enjoyable to switch off once I’d sampled a few minutes. The idea is that a dodgy government agency (plenty of them to choose from) springs criminals from jail so that they can commit nefarious yet deniable acts which the official law and organisations could not possibly dirty their hands with. Not a bad premise for a light entertainment vehicle, even though one shudders at the prospect that it might provide more grist for the Diana conspiracy theorists' mill. Andrew Buchan plays the central character, John Mercer. He has experience of warfare, and is an accomplished killer - he murdered a couple who molested his beloved sister (played by Liz White from ‘Life on Mars’) – yet has a genuine vulnerability. I wasn't sure about the casting of Buchan in the opening scenes, but he grew on me as the story went on. He is teamed up with a Jack the Lad called Calum, who is in the script for light relief. They work alongside glamorous Tamzin Outhwaite and the man in charge, splendidly menacing Peter Mullan. It’s early days yet, but this series may be worth sticking with. I’ll certainly take a look at the second episode. Though I know, I know, I really do need to get cracking with this novel…. Someone From the Past was the title of the last crime novel that Margot Bennett wrote. It was published in 1958, three years after the clever and unusual The Man Who Didn’t Fly, which was a runner-up for the Crime Writers’ Association’s Award (now the Gold Dagger, or, if you prefer the current name, the Duncan Lawrie Dagger.) Nancy Graham investigates the death of Sarah Lampson, who has apparently been killed by one of her former men friends. Someone from the Past actually won that CWA Award. Yet something extraordinary happened thereafter – Margot Bennett never published another crime novel. I find this a fascinating mystery in itself. More about Bennett (with some clues, but not, I’m afraid, a definitive solution to the puzzle) in another post shortly. I’ve reviewed crime novels for upwards of twenty years now, starting out in the 1980s, before I’d published any fiction of my own. I began by volunteering myself to a now-vanished magazine called ‘The Criminologist’ as a crime fiction reviewer (before then I’d reviewed various legal tomes for law magazines.) At first I concentrated exclusively on new fiction, but in recent years I’ve paid quite a lot of attention to reviewing older books. Reviewing has led on to other things, such as invitations to contribute to a variety of reference books, mainly in the crime field, but sometimes outside it. One of the attractions of reviewing from my point of view is that it helps to focus the mind on what the author is trying to achieve with the book. It doesn’t seem to me to be sensible to waste time criticising writers for what they are not trying to do. Christie never aimed to become a second Proust, for instance. Another attraction is that it’s always pleasurable to guide others to a good book that they may otherwise never have encountered. With that in mind, when it comes to new books, I have a slight bias in favour of writers who tend to be overlooked, much as I relish the latest Reg Hill, Ruth Rendell and so on. Sandra Ruttan posed a interesting question on her blog recently, as to whether it was appropriate to judge different types of crime novels by different standards – in effect, taking a ‘softer’ line with thrillers than, say, with novels of psychological suspense. I shared what I think was the majority view, that this kind of differentiation doesn’t really work – not least because it’s very difficult, possibly futile, to divide crime novels into various hard-and-fast compartments. But I have started wondering whether it is, in some ways, easier to review older books than brand new ones – and, perhaps, easier to assess them clearly. With books that have been around a long time, one does at least have the luxury of seeing them more clearly in their social and historical context. It may also help to judge a work in the context of a writer’s overall career. There are, though, various drawbacks to this line of thinking. And one of them, needless to say, is that I’d be very sad if people didn’t want to review my own books until I was dead and gone! Ever heard of A.C. and Carmen Edington? Until recently, neither had I. It turns out that they were a husband and wife crime writing team. But they didn’t exactly enjoy the success of Nicci French. 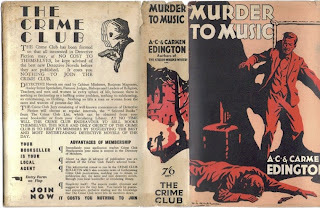 They produced a few books which appeared under the Collins Crime Club imprint during the Golden Age of detective fiction between the wars and then seem to have disappeared from sight. My attention was drawn to them when I chanced upon one of their books for sale on eBay the other day. It was being sold by a dealer in rare books from whom I’ve purchased a couple of titles over the years. His books tend to be far from cheap, but of real quality and distinct scarcity value. However, I was taken aback to see that the starting price for a title by the Edingtons called Murder to Music was no less than £625. Admittedly, it boasted a dust jacket and an inscription from one of the co-authors (A.C.) But even so…. My amazement increased when I found that the final selling price was a hefty £1095. For a book that few people have heard of, by authors who are pretty much forgotten! It’s very thought-provoking. 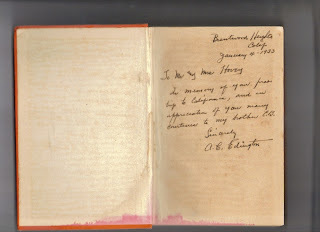 One of the thoughts this has provoked is that the collectability of an old and rare book is increased not merely by the presence of a dust jacket in reasonable condition, but also by a message signed by the author to a recipient. Inscriptions by present day authors are common place. But it was not always so. Because I’m interested in the history of the genre, I must confess to being fascinated by authorial inscriptions from the past, especially when they cast light on the personality or opinions of the author. But it’s a horribly expensive game – even more expensive than I realised, if the outcome of this particular internet auction is any guide. I had not come across the name of Aliya Whiteley until I received a review copy of her second novel, Light Reading. It is her second book, and has been published as part of the Macmillan New Writing series. There is a lot in it to enjoy. More than that, it is among the most original novels I’ve read in a long time. Because it’s both ambitious and quirky, it almost inevitably has one or two flaws, but overall I’d count it as a real success. The story begins with a memorable depiction of the unsatisfying lives of a group of RAF wives, as seen from the point of view of Prudence Green, who opens the story with ‘the usual thoughts of how children gathered around a television screen resemble aliens waiting to receive instructions from the mother ship and whether it was too early to have a third gin and tonic.’. Pru is overweight, collects suicide notes which she buys on the internet, and is haunted by a mysterious event which occurred when she was seventeen. Her best friend Lena is attractive, but with troubles of her own - her husband is involved in a gay affair. When his lover’s wife, Yvonne commits suicide, Pru finds the body – and another suicide note to add to her collection. Soon Pru and Lena flee from the RAF base and pursue the rather barmy idea of investigating the apparent suicide of a former TV star called Crystal Tynee. They finish up in Allcombe, a rather weird seaside town where they encounter a variety of odd characters in their search for the truth about what really happened to Crystal. The sequence of events that have taken place in Allcombe is unlikely to say the least, but this is a funny and sometimes moving book. The wacky plot isn’t the main attraction here. Light Reading should not be considered first and foremost as a detective story, but rather as a study in character. Pru is a marvellous creation and Aliya Whiteley is a novelist with genuine flair. I shall certainly watch out for whatever she writes next. I’ve just come across a book first published four years ago by Andrew Eames, a London-based journalist. The 8.55 to Baghdad is a travel book with a difference, in that it follows in the footsteps of Agatha Christie’s journey to the Middle East in 1928 – a journey that changed her life. Eames was in Aleppo when he heard that Christie had stayed there about three-quarters of a century earlier. He knew next to nothing about the detail of Christie’s life and had, like so many people, thought of her ‘as someone who belonged in the heart of English village life’. Eames writes vividly and, as a long-time Christie fan, I like the idea that he came to realise that there was much more to this remarkable woman than her detractors seem to appreciate. It is not mere chance that Christie has become a global publishing phenomenon – there are reasons for it, and they lie in the books, and in the character of the woman who produced them. I haven’t got far into Eames’ book yet. But so far it is excellent. When I was at work on The Arsenic Labyrinth, the research in Coniston was great fun (the BBC TV regional news even filmed me wandering around the jetty, where the climactic scene takes place.) I was also fortunate to be shown around the Bagshaw Museum in Yorkshire, which provided me with ideas for the fictional Museum of Myth and Legend, which I plonked down on the main road into Coniston. The curator at Bagshaw is Kathryn White, wife of Sherlock Holmes expert David Stuart Davies; it’s a marvellous place, and I recommend a visit if you are ever in the area. When I was researching into the history of arsenic labyrinths, I received help from an archaeologist called Adam Sharpe, who has been involved with the restoration of the labyrinth at Botallack in Cornwall. In the story, historian Daniel Kind is working on a book about John Ruskin, and the director of the Ruskin Foundation, Howard Hull, gave me some very useful info about Ruskin’s relations with the people of Coniston. CSI experts Helen Pepper and Andy Barrett gave me a lot of help with forensic stuff, Roger Forsdyke guided me on police procedure and John Prest, a former Balliol history don, gave me insight into the world of historians that helped me to develop Daniel. I didn’t know John when I was a student, but I got to know him after I contributed an article on Balliol’s detectives (e.g. Wimsey and Gideon Fell) and crime novelists (too numerous to mention) to the college magazine, which John edited. And as a result of that article, Tim Heald – about whom more in the future – got in touch. But I digress. The point I was trying to make is that, before I gained experience as a writer, I thought of research as a chore, and something to avoid. I was wrong. It’s not only hugely enjoyable, it’s a way of getting to know people and places you would never otherwise encounter. And, like many other writers, I never cease to be amazed by the generosity of the people whom I consult. When watching the latest news on tv, it’s easy to become despondent about the way some individuals behave, but the reality is that the vast majority of people are decent. Trouble is, you can’t write a crime novel with a cast of entirely decent suspects…. John Creasey was a legendary figure in the history of British crime fiction. Few writers can have matched him either for determination or the almost infinite capacity to come up with ideas. He is famed for having received 743 rejection slips before his first novel was accepted, but once he became a published author in 1932, there really was no stopping him. He proceeded to turn out, under a bewildering assortment of pen-names, well over 500 novels, and many short stories. Creasey was a man of amazing energy. Quite apart from his books, he found time to conceive and set up the Crime Writers’ Association, to establish his own mystery magazine and even to found a political party. When I was asked to edit an anthology to mark the CWA’s Golden Jubilee celebration, I wanted to include a story by Creasey, and my researches led to a meeting with one of his children, Richard, who has himself achieved considerable success in the media world. We met at the BBC, where Richard was working at the time, and he told me fascinating stories about his father’s dynamism. More recently, I’ve been in touch with Val Edwards (no relation), one of the people who used to type the manuscripts that Creasey produced in long hand. Her reminiscences were interesting too. She said that it was Creasey’s speed that impressed her most. He wrote remarkably quickly, and he walked very quickly too – despite the fact that he had a limp. Creasey was no great stylist, and he felt bruised by the lack of critical acclaim for his work, even though it was commercially very successful. I once heard Julian Symons give a talk in which he described how Creasey wanted Symons removed from the CWA for having the temerity, in his reviews, to be less than ecstatic on occasion about the CWA’s founder’s work. Symons was always a tough judge and Creasey was perhaps an over-sensitive man, but the rift was eventually healed. A good thing, too. Whatever Creasey’s literary shortcomings, he was to my mind an admirable man - and those who have spoken to me about him over thirty years after his death have always done so with affection and respect. He realised that life is short and he filled his life with practical accomplishment. His personal story is one of triumph over adversity, whether in the field of writing – or even the apparently simple matter of walking at a rapid pace. I spoke recently about the rise in popularity in the UK of translated Scandinavian crime fiction. In the last few years, a couple of trends have been quite marked. First, there has been an increasing number of British writers setting their books overseas (examples include Donna Leon and the sadly now deceased Michael Dibdin and Magdalen Nabb.) Second, more and more writers from overseas have been published with success in this country. These are not brand new developments – Christie wrote several books set in the Middle East, and there are other examples even pre-dating the Golden Age, while a number of foreign writers, such as Leblanc and Simenon, appeared in English translation many years ago – but nevertheless, the scale of the change seems to me to be undeniable. I’ve just received two new books written by a Welsh-born journalist and crime novelist, Matt Rees. He has produced non-fiction about the Middle East in the past, but now he has begun a series featuring ‘crime-fighting Palestinian history teacher Omar Yussef’. The Bethlehem Murders appears in a paperback edition, while The Saladin Murders is a brand new hardback. I see that the first book earned very good reviews, and has sold in 16 countries, quite an achievement. We hear a lot (too much?) about ‘globalisation’. Some of its effects are good, some not so good. But as far as crime fiction is concerned, I think the change is for the better, since the effect has been to enrich our literature. Incidentally, for up to date news on ‘Eurocrime’, and much more, you can’t do better than take a look at Karen Meek’s excellent blog and website of that name. Because they were set up by someone with a passion for the subject, they exemplify internet resources at their best, with commentary that is both insightful and highly informative. Edward D. Hoch, who died in January, was the most prolific writer of short mystery stories. I’m not sure who is the British author who has published most short mysteries, but Michael Gilbert must certainly be a contender. His output in the short form even justified the publication of a useful bibliography by Barry Pike; it covers stories which appeared up to 1997, and was published as a supplement to Geoff Bradley’s CADS. Opinions vary as to which of Gilbert’s short story collections was the best. Many would choose Game Without Rules, his first gathering of spy stories featuring Calder and Behrens. Ellery Queen, no mean judge, ranked this book alongside Somerset Maugham’s classic Ashenden. My own favourite is Stay of Execution, a collection of varied stores of legal practice that is at least as successful as another fine book, Best Detective Stories of Cyril Hare – which happened to be edited by Michael Gilbert, not long after Hare’s sadly premature death. There are some terrific twists in the stories, as well as a good deal of humour. The very short ‘Back on the Shelf’ is a gem. In his later years, Gilbert turned out a number of first rate stories – he kindly allowed me to include the excellent ‘Judith’ in an anthology called Mysterious Pleasures – and in addition published collections of stories he’d written many years earlier, featuring his London detective Patrick Petrella. There was a sound collection featuring a lawyer called Jonas Pickett, Anything for a Quiet Life, and Even Murderers Take Holidays was published less than a year ago. Crippen and Landru have published two more collections, and a third is on the way. The fact that there is clearly a market for these books, even though many of the stories in them date back to the 1950s, is a tribute to Michael Gilbert’s gifts. As a story-teller, he was outstanding. In any list of bizarre whodunit titles, Twenty-Five Sanitary Inspectors would surely rank high. The book was written by Roger East in 1935 and reprinted half a century later in a series called ‘The Disappearing Detectives’, each of which included a useful introduction from H.R.F. Keating. As he says, even such an intriguing title failed to save the book, its detective Superintendent Simmons, and its author from obscurity. This is so despite a number of factors which should have played in East’s favour. First, his career got off to a successful start with Murder Rehearsal, which earned a rave review in the Manchester Evening News: ‘…he seems likely to become of the small band of really first-class detective story writers.’ And when I tracked the book down, I found that it is indeed an enjoyable mystery, with an excellent, quirky premise, although the resolution of the puzzle is not quite up to the same high standard. Second, East did not fade quickly from the scene; after taking a break from Simmons with the advent of war, he continued to write occasional crime novels until the 1960s. Third, he had genuine talent and wrote scripts for film and television, including the Maigret series. But to write sporadically is seldom enough to maintain a reputation unless one truly is in the top flight. As Keating says, ‘I have been unable to find the name Roger East in any of the who’s-whos and encyclopaedias, and his books proved almost untraceable…’ Sobering. But on the evidence of the few books by East that I've read, I agree with Keating that his neglect is undeserved. The Indispensable Julian Rathbone is a very good introduction to the work of a gifted writer whose death at the age of 73 has just been announced. The book was published by The Do-Not Press (excellent name, yes?) in 2003; Do-Not was the brainchild of Jim Driver, with whom I worked on three crime anthologies a few years back. Jim is someone who really cares about both literature and music; sadly, he found that publishing crime didn’t really pay and now he focuses on music, so it’s now a case of Do-Not Publish. But while the business was running, Jim turned out some excellent books and I’d say that the Rathbone collection is as good as any of them. The book contains not only a generous sampling of Julian Rathbone’s work, but also plenty of information about an interesting life. He came from the same family, apparently, as Basil Rathbone, arguably the greatest Sherlock Holmes of them all, was a Cambridge contemporary of Sylvia Plath, and was taught by F.R. Leavis. He was twice nominated for the Booker Prize – a unique achievement for someone generally associated with the crime/espionage genre. His debut novel Diamond Bid was well reviewed by Francis Iles, something he recalled with appreciation many years later. Iles, aka Anthony Berkeley, was a very different writer, with very different political leanings, but a critic smart enough to recognise real talent. Rathbone’s left wing views influenced his attitudes, and certainly his work, but although he had a disdain for privilege, he avoided the trap of didacticism, and he had a flair for producing intelligent entertainment. Of the books published in his later years, A Very English Agent stands out as a highly successful novel of historical espionage. Julian Rathbone and I briefly shared the same publisher; I met him two or three times, but only fleetingly, and although I found him charming (for some reason, I’d expected someone rather fierce) we never had a lengthy chat. And now we never will. A pity. I have little doubt he would have been a fascinating and incisive conversationalist. I've mentioned before that such successful and prolific writers as W.J. Burley andAlan Hunter, creator of Charles Wycliffe and George Gently respectively, were disciples of the late Georges Simenon. Lately I’ve discovered that the legendary Belgian’s work has had a significant influence on John Banville, since he turned to writing crime fiction as Benjamin Black. Point Blank also made a superb film, starring Lee Marvin and the under-rated Angie Dickinson. I saw it again last year, after a gap of three decades, and was even more taken with it the second time around. I don’t associate Jim Carrey with ‘dark psychological thrillers’, but that’s what you get with the recent Joel Schumacher movie in which Carrey plays a dog-catcher called Walter Sparrow. Walters’ wife buys him a battered, apparently self-published book called The Number 23. The book features a detective called Fingerling who has a dark secret. As Walter reads on, it becomes evident that there are similarities between Fingerling’s life and his own. And when he finishes chapter 22, the story suddenly. Stops. At first the film is brightly lit, but the mood quickly darkens, along with the lighting, as Walter’s world and the work of fiction collide. The key to the story lies in the omnipresence of the number 23. It gets everywhere, it seems. 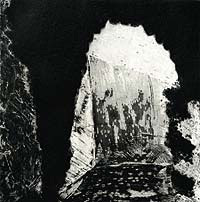 Example after example of its sinister significance are fired at the viewer. No wonder Walter becomes obsessed. This fixation with the mystique of numbers gives the film a good deal of appeal (at least for trivia buffs like me) and Schumacher plays endless clever games with it. The excellence of the premise is not, in truth, matched by the overall quality of the plotting. There are frustrating loose ends – for instance, I never figured out: why did Walter’s wife choose that particular book? Worse, although the denouement is bravely counter-intuitive, I think most people will find it rather unsatisfactory. Nevertheless, it’s a short, snappy film that I was pleased to have seen. And this obsession about the number 23 is definitely catching. Take today, for instance. Day 2 of month 3. 23!! Oh no, now the number’s taking over my life too. Aaaaaagh…. I’ve just received a ring-bound proof of the latest novel by one of my all-time favourite crime writers – it’s The Headhunters, by Peter Lovesey. The book is due for hardback publication in the UK on 1 May and it features DCI Hen Mallin, whom many readers will recall from an earlier Lovesey novel, The Circle. This is Lovesey’s thirtieth novel (I take the publishers’ word for this; I haven’t counted up myself.) It’s quite a landmark, therefore, and an appropriate moment to take stock of his achievements. No fewer than thirteen of his books have either won or been short-listed for major awards, while ten (if one includes a short story) have been televised or filmed. The majority of the latter were entries in his original Sergeant Cribb series. I enjoyed those books, which made Lovesey’s name, but I missed the television series and I’m hoping to catch up with it through the wonders of satellite televison re-runs before too long. Peter Lovesey is to be honoured at this year’s Malice Domestic convention in Washington D.C., with a lifetime achievement award. This is richly deserved. A couple of years back, I had the privilege of being with Harry Keating and his wife Sheila when he received the same award. Unfortunately, other commitments prevent me being there to join in the celebration when Peter accepts his award. But I have absolutely no doubt that he’ll be a hugely popular honoree. Meanwhile, I have The Headhunters to look forward to.